Auditorium Orchestra Pit boards: Underneath here is room for a 16 piece orchestra and beyond that the orchestra's changing rooms. 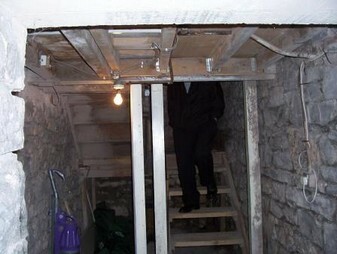 The investigators during an early ghost hunt by Ghost Watch, one of the first ghost hunts at the castle, which occurred in October 2003, had space allocated to the investigators themselves, sleeping in the cellars below the stage. They heard the sound of a ball being bounced between the beds in the centre of what was the dressing room. They felt the bouncing ball was from a child who was playing and they picked up on a some giggling as well - a child's laughter, as if playing. In the hospital days the theatre was not used as a ward, but was a rest area and play area for patients; later they even had a television in the theatre. A couple of months later, we had a large number of people staying during New Years Eve and as overflow, we had some people staying in the same cellars, below the stage. The next day, on New Years Day, they too reported they had heard sounds, like a child bouncing a ball, and also the sound of a stick being dragged along the radiators. At no time had the second group, attending a New Years Eve Banquet and function, come into contact with anyone from October's 'Ghost Watch' ghost hunting group. These were two separate events involving groups of people attending different functions, the second group, who were not looking for ghosts, having no knowledge of the experience of the first group. It is curious that this phenomenon has been repeated in this way with two groups having no connection to each other nor, in the case of the second party of New Years Eve Banquet guests, any 'ghost-hunting' interest. Subsequent ghost tours have had similar experiences, though this may be 'suggested' by prior knowledge of this phenomenon. 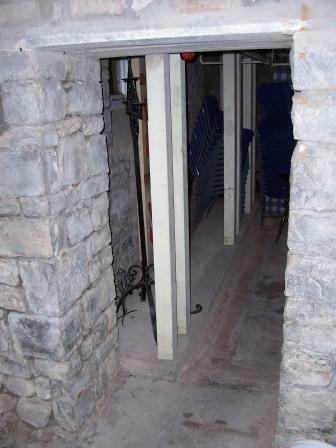 While we no longer allow guests to sleep in this area due to fire regulations, it is an 'active' area and very much of interest to ghost hunters.